What can I do to prevent WDO infestation? One source of moisture is from the ground. 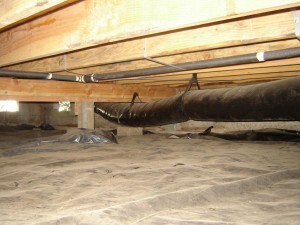 To minimize the impact in your crawlspace from moisture, install a vapor barrier over the ground. The vapor barrier is typically a 6-mil polyethylene vapor retarder or an equal material. Check your crawl space vent screens. Repair any defective screens. You want an air exchange in your crawl space, but you don’t want any unwelcome guests to get through either. This is accomplished by installing a screen over the vent openings. The concept is the same as a window screen or a screen door. If a malfunctioning or missing screen is found, the screen needs to be repaired. If you are unable to repair the screen right away we recommend that you block either that section of the screen or the whole vent to prevent infestation until a repair can me undertaken. 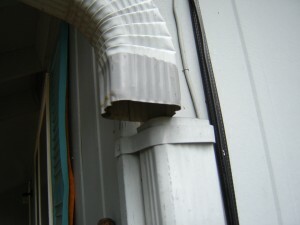 Confirm that the downspouts send water away from the home instead of pooling next to the home. Water pooling near the foundation not only decreases the stability of the foundation, but the high moisture content also promotes infestation. 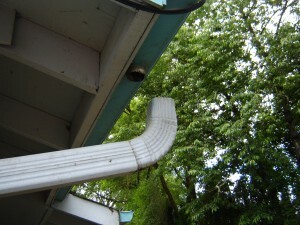 Make sure that your gutter/downspout system is working correctly to divert rainwater away from the structure. Adjust all lawn sprinklers to keep water at least 3 feet from the foundation. Check and repair all caulking around tub and shower fixtures. We were told of a homeowner nightmare. A couple bought a home and unknown to them, the shower fixtures on the 2nd story had not been caulked to prevent moisture from entering the wall cavities. This was an energy efficient couple and they took very short showers. After a year of living in the home, they had a guest stay with them and she took a long shower. As the couple were on the 1st floor, they noticed water dripping from the ceiling a foot away from their entertainment center. Upon investigation, they learned that they had been inadvertently directing water into their walls through these unmaintained fixtures. Luckily only a minor mold had developed from the situation and upon drying, the mold had died. They ended up with a small sheet rock repair job and a $5 caulking project. The situation could have been much worse! A simple monitoring of the bath hardware and a tube of caulking from the hardware store is often a huge preventive measure that often goes overlooked. Verify functionality of bath and kitchen ventilation fans. These exhaust fans remove excess moisture from your home. Moisture is the key element in home infestation, so it is in our best interest to remove excess moisture from our homes. 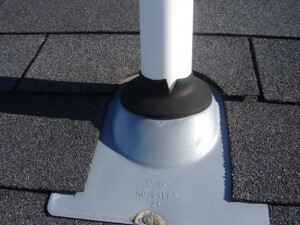 The vent boot is the moisture defense for the area where the roof vent meets the roof flashing. If the boot becomes worn and defective, then a potential moisture problem exists. They are simple to install and they are relatively inexpensive. I have found them for less than $10 at my local hardware store. The pic below shows a boot with a vertical crack. The boot bay still be functioning properly, but the lifespan of the boot has been severely reduced.